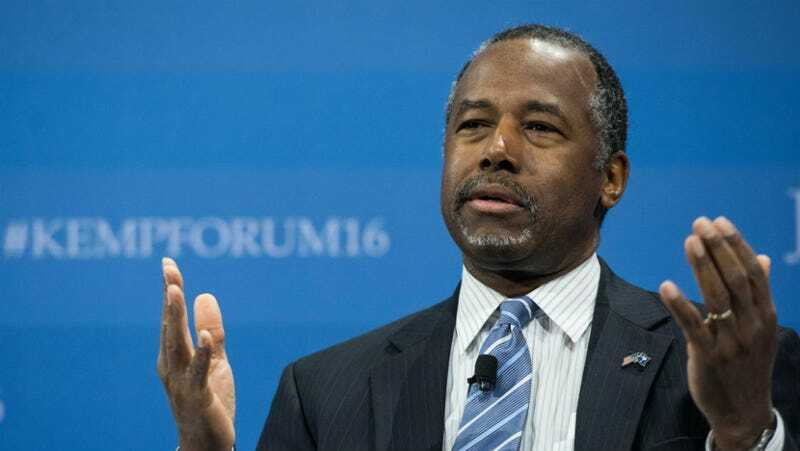 Ben Carson doesn’t hate Muslims, per se—he just doesn’t think one should be president, he’s pretty sure they’re all going to sharia us in our sleep, and a Muslim civil liberties organization shouldn’t be allowed to attend the State of the Union and should be investigated for possible jihad. That’s all. Carson spoke to CNN’s “New Day” this morning, in an interview we spotted via the Associated Press and Talking Points Memo. He brightly suggested that the well-respected Council on American Islamic Relations shouldn’t be allowed to attend the State of the Union, which they’re doing: Congresswomen Zoe Lofgren of California and Alcee Hastings of Florida will both be hosting CAIR officials from their home states. Sameena Usman, a “government relations coordinator” based in San Francisco will attend with Lofgren, while Nezar Hamze, the CFO of CAIR Florida, will attend as Hastings’ guest. “These are people who I have called for an investigation of,” Carson told host Alisyn Camerota. “We can’t now sit there and say these are buddy buddies of ours, [so] let’s go ahead and investigate the thing. The candidate, whose campaign manager and spokesperson both recently resigned in a hasty fashion, also promised that he’d have more “pep in my step” going forward, especially during the next debate on Thursday. He sounds so convincing when he says it.